The Alexander Graham Bell Association for the Deaf and Hard of Hearing (AG Bell), applauds DiMarco’s achievements and recognizes that ASL exists as a communication option for deaf children. However, it is just one such option and its use is declining. The reality is that most deaf children – more than 95 percent – are born to parents with typical hearing, and 90 percent of these families are choosing listening and spoken language for their deaf child, according to data from BEGINNINGS for Parents of Children who are Deaf and Hard of Hearing in North Carolina. For families who choose a listening and spoken language outcome, which is the majority of families, DiMarco’s statements perpetuate the misconception that deaf children cannot listen and speak well. Deaf children growing up today have unprecedented opportunities to develop listening and spoken language, thanks to newborn screening, early identification and intervention, and the latest technology, such as advanced hearing aids and cochlear implants. 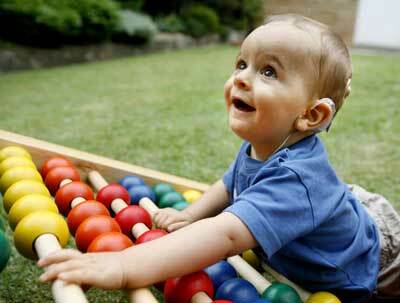 Given the tremendous advances in hearing technology, deaf children are able to learn spoken language by listening. Indeed, when identification and intervention with appropriate technology occur early enough, most of these children develop language much as children with typical hearing do. Recent studies show that children who solely utilize listening and spoken language, rather than a combination of this with ASL, demonstrate better listening and spoken language skills than do children who follow a combination approach, and that these children frequently develop expressive and receptive language test scores similar to their typical hearing peers. In informing parents about communication options for their deaf children, current and emerging evidence should be considered. While bilingualism (use of ASL along with spoken language) may be helpful to deaf children who are unable to fully achieve spoken language, a young child whose family desires spoken language often achieves their desired outcome better through a full immersion in spoken language. Moreover, the window for a deaf child to acquire listening and spoken language is much shorter than the window in which ASL can be acquired. Deaf children frequently communicate quite well with listening and spoken language alone, and the number of children who have a need for ASL has decreased dramatically. When today’s parents are told that their deaf children should or must learn ASL as part of a Deaf culture, they increasingly respond that their children actually are part of a hearing culture – that of their families, friends and the world at large. The voices of our deaf children tell the story. In videos available on AG Bell’s YouTube channel, families share the remarkable abilities of deaf children today—making music, singing songs, and participating fully in sports, theater and more, with wonderful speech and remarkable hearing. Hey AGB, I’ll take you seriously when you 1) cite your sources and 2) don’t cite sources that you fund. BEGINNINGS exec director was on your board for three years. It’s unsurprising that they would find supposedly results favorable to your mission. As educators for the Deaf who use ASL and work in a Regional program for the Deaf, we are more than familiar with the debate that has defined Deaf Education for hundreds of years—the “oral vs. sign” debate. We have wished for some time now that this particular debate was finally put to rest—that parents, educators, and professionals of all kinds would recognize the tremendous benefits, linguistically, neurologically, and cognitively, of using ASL with Deaf children—regardless of whether these same children received some kind of speech training or acquired language with the support of assistive technology. After reading AG Bell’s patronizing response (Dispelling Myths About Deafness by Meredith Sugar, Esq.) to the Washington Post’s article on Nyle DiMarco, we realized the battle for the hearts and minds of parents of Deaf children is far from over. Although hearing aids and cochlear implants can surely supplement a child’s exposure to language, these mechanisms are no substitute for the kind of genuine and authentic linguistic input that facilitates the language acquisition process. Simply put: Deaf children should be provided with ASL during their formative years. While AG Bell’s response was filled with falsehoods and incorrect assertions, one sentence in particular jumped out at us: “Children frequently communicate quite well with listening and spoken language alone, and the number of children who have a need for ASL has decreased dramatically.” Let us be perfectly clear, Mrs. Sugar: we teach high school students. For twenty years, our classes have been FULL of students who come from “oral” backgrounds and “sound great.” Unfortunately, they don’t understand a fraction of what they should. When they enter our program, however, the blindfold literally comes off. They finally start to understand what is going on in the classroom for the first time because they now have access to their language—ASL. If we had a dime for every one of our students who was made to “listen and speak” as a young child, we’d be rich women. Their stories are simply heartbreaking. They have been deprived of the most basic of human rights—the right to language. And your organization, driven by fear, ignorance, and arrogance, seeks to perpetuate this isolation and language deprivation. In fact, your organization’s work contributes to a common trajectory: The typical Deaf child, once diagnosed with a hearing loss, is referred to a doctor, and then an audiologist. In an attempt to make him as “normal as a hearing child,” he is fitted with hearing aids or implanted with a cochlear implant, and speech therapy begins. He is enrolled in an oral program. By the time he is finished with elementary school, and his communication abilities and reading level have stagnated, parents are usually taken aside and told that they might want to “consider a Total Communication program” where sign language is used. By that time, the child’s language delay is solidified, and he faces a never-ending game of catch-up. He is engaged, with his teachers and parents, in a Herculean effort to close the proverbial gap. The irony is that hearing parents of hearing children recognize and understand the benefits of ASL on language acquisition and development! And yet hearing parents of Deaf children are scared off from using ASL because of fear tactics from organizations like yours. This juxtaposition is disturbing—it feels like a nightmarish Surrealist painting. But it’s not a nightmare. It’s real. And it’s real for the thousands of Deaf children who have been denied their basic. Human. Rights. Furthermore, there is simply no basis to your contention that “the window for a deaf child to acquire listening and spoken language is much shorter than the window in which ASL can be acquired.” The critical period is the critical period. The fact that you equate what happens in the brain with what comes out of a voice box simply underscores what you don’t know. Speech is not language. Language develops not in our throats but in our minds. Exposure to language provides the foundation for all cognitive processes. Our ability to reason, to think critically, to think abstractly, to make deductions, to process information—all of these skills are predicated on exposure to language. Language is to the human mind what water and sun are to plants—without language, our brains simply do not develop in the way they were designed to, and our faculties do not reach their full potential. The implications, then, for a lack of exposure are sobering. Deaf Education is not an either/or proposition, as your organization would have parents and your donors believe. Why not give a Deaf child everything, including ASL? Why must you turn the development of these children into a Zero Sum game? You can put as many pictures of smiling children on your website as you want. But know this: as teachers, we’ve seen the pain behind those smiles. We’ve seen the loneliness, the isolation, and the resentment. These children grow up. And when we and our colleagues meet them as adolescents, we are charged with making them whole again and putting them back together. We join them on their journey, and we do it gladly. But it’s not easy. Please don’t make our jobs any more difficult. Please stop perpetuating the myth of the Happy Speaking and Listening Deaf Child. He doesn’t exist. Laurie Drago, M.A. Kay Anderson, M.A. The concept of the word “DEAF” as described in any dictionary is: the inability to hear. Apparently AGBell Association cannot grasp that one single concept. They consistently spread myths and propaganda and lies and cause so much damage in the psyche of deaf babies from which it is difficult to recover. Science has shown repeatedly that babies, deaf or hearing, pick up sign language at a faster rate than any spoken language! In fact, hundreds of thousands of families are teaching their hearing children basic signs in order to lessen the frustration of lack of communication during the baby’s first years. Yet, AGBell insists that DEAF babies need to be deprived of their natural language. MRI scans show serious damage to that part of the brain associated with language acquisition in deaf babies that are deprived of ASL exposure compared to the brains of babies exposed to ASL at an early age. The data are astounding and freely available in the public domain. There is something sinister about AGBell forcing families to forgo sign in favor of speech! Cochlear Implants! The industry with deep pockets have been funding AGBell. They have only one MD on their board and he is the chair of the John Hopkins Hospital Listening Center. Co-incidence? I think some research needs to be done on how much the industry has paid the staff of AG Bell and other cochlear implant centers. but by hearing people who choose to limit us.